To set against five brief episodes of mass extinction – some would count the present as being the beginning of a sixth – is one short period when animals with hard parts appeared for the first time roughly simultaneously across the Earth. Not only was the Cambrian Explosion sudden and pervasive but almost all phyla, the basic morphological divisions of multicellular life, adopted inner or outer skeletons that could survive as fossils. Such an all-pervading evolutionary step has never been repeated, although there have been many bursts in living diversity. Apart from the origin of life and the emergence of its sexual model, the eukaryotes, nothing could be more important in palaeobiology than the events across the Cambrian-Precambrian boundary. This eminent event has been marked by most of the latest issue of the journal Gondwana Research (volume 25, Issue 3 for April 2014)in a 20-paper series called Beyond the Cambrian Explosion: from galaxy to genome (summarized by Isozaki, Y., Degan, S.., aruyama,, S.. & Santosh, M. 2014. Beyond the Cambrian Explosion: from galaxy to genome. Gondwana Research, v. 25, p. 881-883). Of course, these phenomenal events have been at issue since the 19th century when the division of geological time began to be based on the appearance and vanishing of well preserved and easily distinguished fossils in the stratigraphic column. On this basis roughly the last ninth of the Earth’s history was split on palaeontological grounds into the 3 Eras, 11 Periods, and a great many of the briefer Epochs and Ages that constitute the Phanerozoic. Time that preceded the Cambrian explosion was for a long while somewhat murky mainly because of a lack of means of subdivision and the greater structural and metamorphic damage that had been done to the rocks that had accumulated over 4 billion years since the planet accreted. Detail emerged slowly by increasingly concerted study of the Precambrian, helped since the 1930s by the ability to assign numerical ages to rocks. Signs of life in sediments that had originally been termed the Azoic (Greek for ‘without life’) gradually turned up as far back as 3.5 Ga, but much attention focused on the 400 Ma immediately preceding the start of the Cambrian period once abundant trace fossils had been found in the Ediacaran Hills of South Australia that had been preceded by repeated worldwide glacial epochs. The Ediacaran and Cryogenian Periods (635-541 and 850-635 Ma respectively) of the Neoproterozoic figure prominently in 9 of the papers to investigate or review the ‘back story’ from which the crucial event in the history of life emerged. Six have a mainly Cambrian focus on newly discovered fossils, especially from a sedimentary sequence in southern China that preserves delicate fossils in great detail: the Chengjian Lagerstätte. Others cover geochemical evidence for changes in marine conditions from the Cryogenian to Cambrian and reviews of theories for what triggered the great faunal change. Since the hard parts that allow fossils to linger are based on calcium-rich compounds, mainly carbonates and phosphates that bind the organic materials in bones and shells, it is important to check for some change in the Ca content of ocean water over the time covered by the discourse. In fact there are signs from Ca-isotopes in carbonates that this did change. A team of Japanese and Chinese geochemists drilled through an almost unbroken sequence of Ediacaran to Lower Cambrian sediments near the Three Gorges Dam across the Yangtse River and analysed for 44Ca and 42Ca (Sawaki, Y. et al. 2014. The anomalous Ca cycle in the Ediacaran ocean: Evidence from Ca isotopes preserved in carbonates in the Three Gorges area, South China. Gondwana Research, v. 25, p. 1070-1089) calibrated to time by U-Pb dating of volcanic ash layers in the sequence (Okada, Y. et al. 2014. New chronological constraints for Cryogenian to Cambrian rocks in the Three Gorges, Weng’an and Chengjiang areas, South China. Gondwana Research, v. 25, p. 1027-1044). They found that there were significant changes in the ratio between the two isotopes. The isotopic ratio underwent a rapid decrease, an equally abrupt increase then a decrease around the start of the Cambrian, which coincided with a major upward ‘spike’ and then a broad increase in the 87Sr/86Sr isotope ratio in the Lower Cambrian. The authors ascribe this to an increasing Ca ion concentration in sea water through the Ediacaran and a major perturbation just before the Cambrian Explosion, which happens to coincide with Sr-isotope evidence for a major influx of isotopically old material derived from erosion of the continental crust. As discussed in Origin of the arms race (May 2012) perhaps the appearance of animals’ hard parts did indeed result from initial secretions of calcium compounds outside cells to protect them from excess calcium’s toxic effects and were then commandeered for protective armour or offensive tools of predation. Is there is a link between the Cambrian Explosion and the preceding Snowball Earth episodes of the Cryogenian with their associated roller coaster excursions in carbon isotopes? Xingliang Zhang and colleagues at Northwest University in Xian, China (Zhang, X. et al. 2014. Triggers for the Cambrian explosion: Hypotheses and problems. Gondwana Research, v. 25, p. 896-909) propose that fluctuating Cryogenian environmental conditions conspiring with massive nutrient influxes to the oceans and boosts in oxygenation of sea water through the Ediacaran set the scene for early Cambrian biological events. The nutrient boost may have been through increased transfer o f water from mantle to the surface linked to the start of subduction of wet lithosphere and expulsion of fluids from it as a result of the geotherm cooling through a threshold around 600 Ma (Maruyama, S. et al. 2014. Initiation of leaking Earth: An ultimate trigger of the Cambrian explosion. Gondwana Research, v. 25, p. 910-944). Alternatively the nutrient flux may have arisen by increased erosion as a result of plume-driven uplift (Santosh, M. et al. 2014. 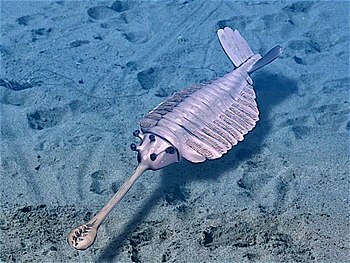 The Cambrian Explosion: Plume-driven birth of the second ecosystem on Earth. 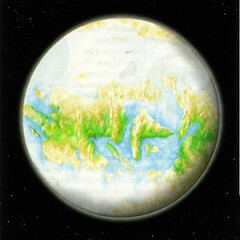 Gondwana Research, v. 25, p. 945-965). A bolder approach, reflected in the title of the Special Issue, seeks an interstellar trigger (Kataoka, R. et al. 2014. The Nebula Winter: The united view of the snowball Earth, mass extinctions, and explosive evolution in the late Neoproterozoic and Cambrian periods. Gondwana Research, v. 25, p. 1153-1163). This looks to encounters between the Solar System and dust clouds or supernova remnants as it orbited the galactic centre: a view that surfaces occasionally in several other contexts. Such chance events may have been climatically and biologically catastrophic: a sort of nebular winter, far more pervasive than the once postulated nuclear winter of a 3rd World War. That is perhaps going a little too far beyond the constraints of evidence, for there should be isotopic and other geochemical signs that such an event took place. It also raises yet the issue that life on Earth is and always has been unique in the galaxy and perhaps the known universe due to a concatenation of diverse chance events, without structure in time or order, which pushed living processes to outcomes whose probabilities of repetition are infinitesimally small. Edicara sandstones in the Flinders Ranges of South Australia (credit: Wikipedia). The first macroscopic life forms were the enigmatic bag-like and quilted fossils in sedimentary rocks dating back to 635 Ma in Australia, eastern Canada and NW Europe. They are grouped as the Ediacaran Fauna named after the Ediacara Hills in South Australia where they are most common and diverse. Generally they are not body fossils but impressions of soft-bodied organisms, often in sandstones rather than muds. Some are believed to be animals that absorbed nutrients through their skin, whereas others are subjects of speculation. One thing seems clear; these first metazoans arose because of some kind of trigger provided by the global glacial conditions that preceded their appearance. 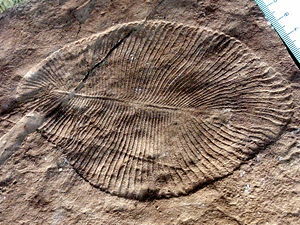 It has always been assumed that, whatever they were, Ediacaran organisms lived on the sea floor, probably in shallow water. New sedimentological evidence found in the type locality by Gregory Retallack of the University of Oregon seems set to force a complete rethink about these hugely important life forms (Retallack, G.J 2012. Ediacaran life on land. Nature (online), doi:10.1038/nature11777). So momentous are his conclusions that they form the subject of a Nature editorial in the 13 December 2012 issue. 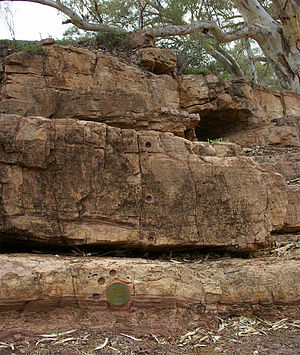 Retallack, a specialist on ancient soils of the Precambrian, examined reddish facies of the Ediacara Member of the Rawnsley Quartzite of South Australia, whose previous interpretation have a somewhat odd background. Originally regarded as non-marine, before their fossils were discovered, when traces of jellyfish-like organisms turned up this view was reversed to marine, the red coloration being ascribed to deep Cretaceous weathering. A range of features, such as clasts of red facies in grey Ediacaran rocks, the presence of feldspar in the red facies – unlikely to have survived deep weathering – bedding surfaces with textures very like those formed by subaerial biofilms, and desiccation cracks, suggest to Retallack that the red facies represents palaeosols in the sedimentary sequence. Moreover, some features indicate a land surface prone to freezing from time to time. The key observation is that this facies contains Ediacaran trace fossils representing many of the forms previously regarded as marine animals of some kind, including Spriggina, Dickinsonia and Charnia on which most palaeontologists would bet good money that they were animals, albeit enigmatic ones. If Retallack’s sedimentological observations are confirmed then organisms found in the palaeosols cannot have been animals but perhaps akin to lichens or colonial microbes, and survived freezing conditions. As they occur in other facies more likely to be subaqueous, then they were ‘at home’ in a variety of ecosystems. As the Nature editorial reminds us, from the near-certainty that early macroscopic life was marine there is a chance that views will have to revert to a terrestrial emergence first suggested in the 1950s by Jane Grey. Uncomfortable times lie ahead for the palaeontological world. Palaeobiologists generally believe that without a significant boost to oxygen levels in the oceans macroscopic eukaryotes, animals in particular, could not have evolved. Although the first signs of a rise in atmospheric oxygen enter the stratigraphic record some 2.4 billion years ago and eukaryote microfossils appeared at around 2 Ga, traces of bulky creatures suddenly show up much later at ~610 Ma with possible fossil bilaterian embryos preserved in 630 Ma old sediments. An intriguing feature of this Ediacaran fauna is that it appeared shortly after one of the Neoproterozoic global glaciations, the Marinoan ‘Snowball’ event: a coincidence or was there some connection? It has looked very like happenstance because few if any signs of a tangible post-Marinoan rise in environmental oxygen have been detected. Perhaps the sluggish two billion-year accumulation of free oxygen simply passed the threshold needed for metazoan metabolism. But there are other, proxy means of assessing the oxidation-reduction balance, one of which depends on trace metals whose chemistry hinges on their variable valency. The balance between soluble iron-2 and iron-3 that readily forms insoluble compounds is a model, although iron itself is so common in sediments that its concentration is not much of a guide. Molybdenum, vanadium and uranium, being quite rare, are more likely to chart subtle changes in the redox conditions under which marine sediments were deposited. Swapan Sahoo of the University of Nevada and colleagues from the USA, China and Canada detected a marked increase in the variability of Mo, V and U content of the basal black shales of the Doushantuo Formation of southern China, which contain the possible eukaryote embryos (Sahoo, S.K and 8 others 2012. Ocean oxygenation in the wake of the Marinoan glaciation. Nature, v. 489, p. 546-549). These rocks occur just above the last member of the Marinoan glacial to post-glacial sedimentary package and are around 632 Ma old. Since the black shales accumulated at depths well below those affected by surface waves that might have permitted local changes in the oxygen content of sea water the geochemistry of their formative environment ought not to have changed if global chemical conditions had been stable: the observed fluctuations may represent secular changes in global redox conditions. The earlier variability settles down to low levels towards the top of the analysed sequence, suggesting stabilised global chemistry. What this might indicate is quite simple to work out. When the overall chemistry of the oceans is reducing Mo, V and U are more likely to enter sulfides in sediments, thereby forcing down their dissolved concentration in sea water. With a steady supply of those elements, probably by solution from basalt lavas at ocean ridges, sedimentary concentrations should stabilise at high levels in balance with low concentrations in solution. If seawater becomes more oxidising it holds more Mo, V and U in solution and sediment levels decline. So the high concentrations in sediments mark periods of global reducing conditions, whereas low values signal a more oxidising marine environment. Sahoo et al.’s observations suggest that marine geochemistry became unstable immediately after the Marinoan glaciation but settled to a fundamentally more oxidising state than it had been in earlier times, perhaps by tenfold increase in atmospheric oxygen content. So what might have caused this and the attendant potential for animals to get larger in the aftermath of the Snowball Earth event? One possibility is that the long period of glaciers’ grinding down continental crust added nutrients to the oceans. Once warmed and lit by the sun they hosted huge blooms of single-celled phytoplankton whose photosynthesis became an oxygen factory and whose burial in pervasive reducing conditions on the sea bed formed a permanent repository of organic carbon. The outcome an at-first hesitant oxygenation of the planet and then a permanent fixture opening a window of opportunity for the Ediacarans and ultimately life as we know it. The combination of glaciogenic sediments with palaeomagnetic evidence for their formation at low-latitudes, together with dates that show glacial events were coeval in just two or three Neoproterozoic episodes are the linchpins for the Snowball Earth hypothesis. There is little doubt that the latest Precambrian Era did witness such extraordinary climatic events. Evidence is also accumulating that, in some way, they were instrumental in that stage of biological evolution from which metazoan eukaryotes emerged: the spectacular Ediacaran fossil assemblages follow on the heels of the last such event (see Bigging-up the Ediacaran in Earth Pages for March 2011). One of the difficulties with the ‘hard’ Snowball Earth hypothesis is how the middle-aged planet was able to emerge from a condition of pole-to-pole ice cover; hugely increased reflectivity of that surface should have driven mean global temperature down and down. Clearly the Earth did warm up on each occasion, and the leading model for how that was possible is massive release of greenhouse gases from sea-floor sediments or deep-ocean waters to increase the heat-retaining powers of the atmosphere; sufficiently voluminous release from volcanic action seems less likely as there is little evidence of upsurges in magmatism coinciding with the events. Almost all glaciogenic units from the Neoproterozoic have an overlying cap of carbonate rocks, indicating that hydrogen carbonate (formerly bicarbonate) ions together with those of calcium and magnesium suddenly exceeded their solubilities in the oceans. To seek out a possible source for sufficient carbon release in gaseous form geochemists have turned to C-isotopes in the cap carbonates. Early studies revealed large deficits in the heavier stable isotope of carbon (13C) that seemed to suggest that the releases were from large reservoirs of carbon formed by burial of dead organisms: photosynthesis and other kinds of autotrophy at the base of the trophic pyramid selectively take up lighter 12C in forming organic tissues compared with inorganic chemical processes). As in the case of the sharp warming event at the Palaeocene-Eocene boundary around 55.8 Ma ago (See The gas-hydrate ‘gun’ in June 2003 Earth Pages), these negative d13C spikes have been interpreted as due to destabilisation of gas hydrates in sea-floor sediments to release organically formed methane gas. This powerful greenhouse gas would have quickly oxidised to CO2 thus acidifying the oceans by jacking up hydrogen carbonate ion concentrations. Detailed carbon-, oxygen- and strontium-isotope work in conjunction with petrographic textures in a Chinese cap carbonate (Bristow, T.F. et al. 2011. A hydrothermal origin for isotopically anomalous cap dolostone cements from south China. Nature, v. 274, p. 68-71) suggests an alternative mechanism to produce the isotopically light carbon signature at the end of Snowball events. The greatest 13C depletion occurs in carbonate veins that cut through the cap rock and formed at temperatures up to 378°C and even the early-formed fine grained carbonate sediment records anomalously high temperatures. So, it seems as if the cap-rock was thoroughly permeated by hydrothermal fluids, more than 1.6 Ma after it formed on the sea floor. 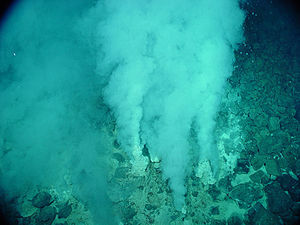 This triggered oxidation of methane within the sediments themselves, with little if any need for an atmospheric origin through massive methane release from destabilised gas hydrates elsewhere.